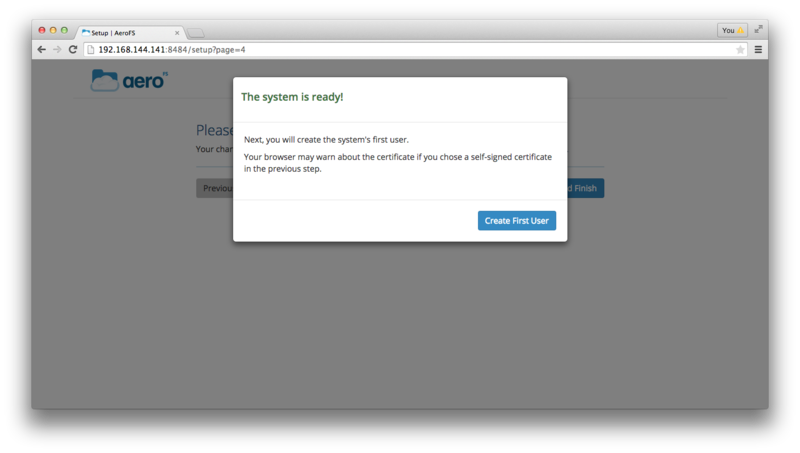 Upload your license file and click Continue. Click Create a New Appliance. Enter a hostname for your appliance (i.e. share.acme.com). 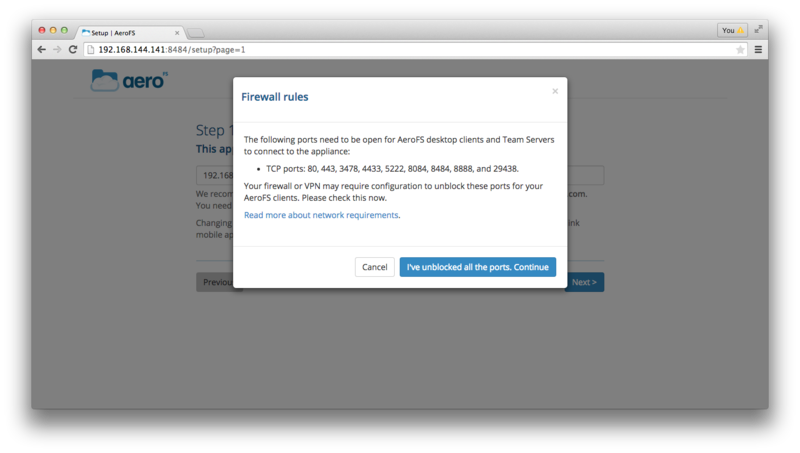 Make sure that the specified TCP and UDP ports are unblocked and click I've unblocked all ports. Continue. If you wish to upload your own certificate and key, select the second option to do so. Otherwise click Next. 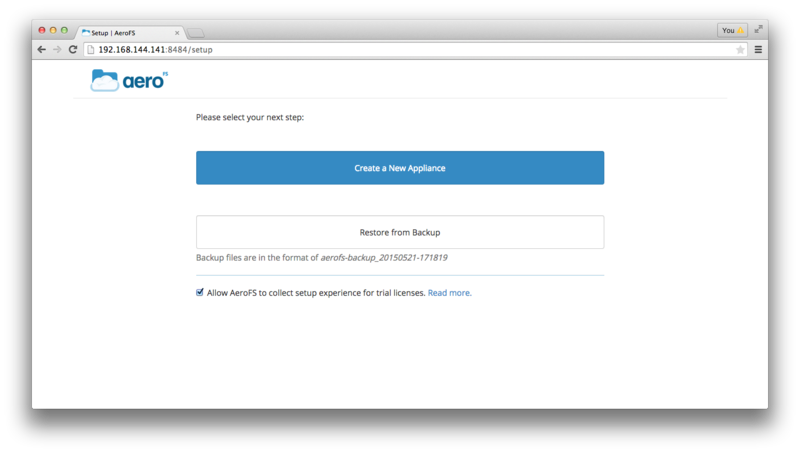 Enter a support email address and click Next. 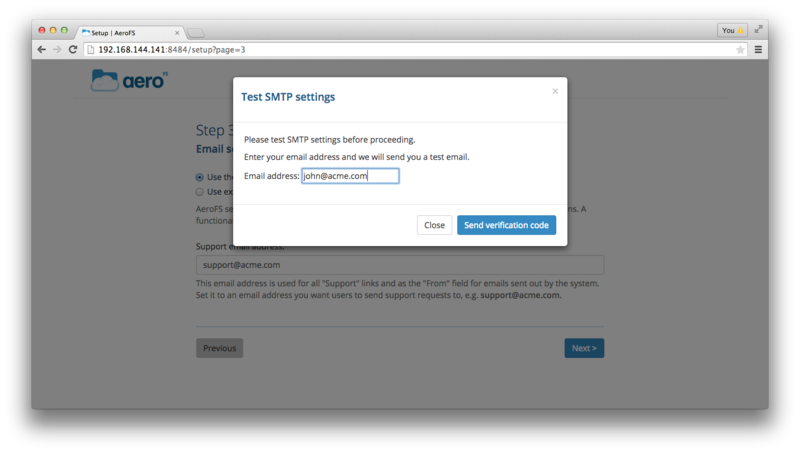 Enter the email address where you would like the SMTP verification code to be sent to and click Send verification code. Open the SMTP verification code email from your inbox (if it's not there, check your spam folders). Copy/paste the verification code into the "Enter test verification code" dialog box and click Verify. 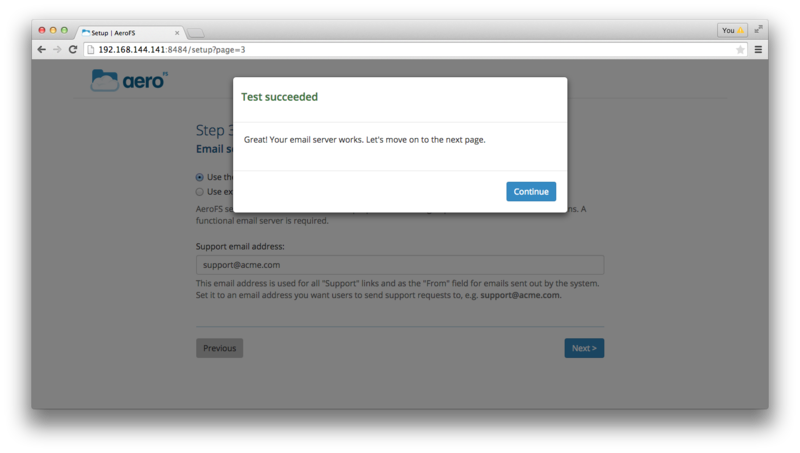 You should get a "Test succeeded" message. Click Continue. Click Apply and Finish to complete the setup. Once the countdown from 90 seconds is complete, you should see a message that says "It should be done very shortly". 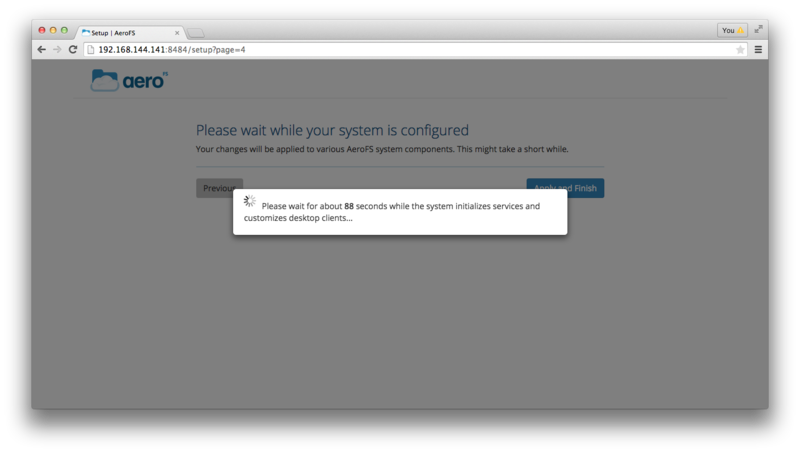 After a few minutes you should see a message that says "The system is ready!". Click Create First User to create an administrator account. 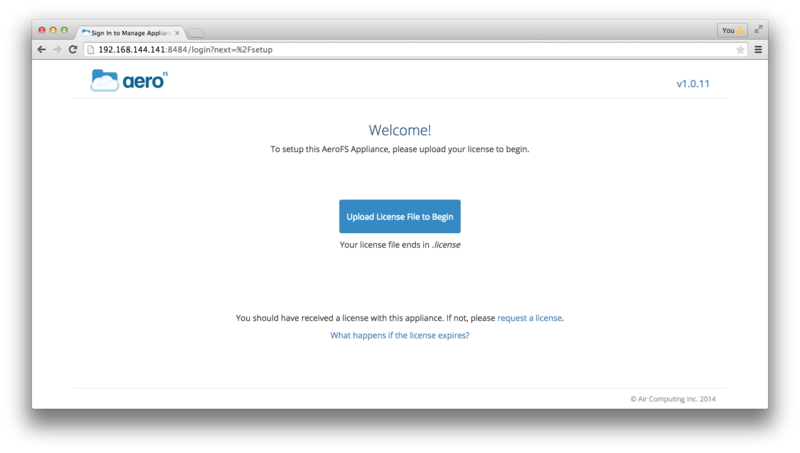 Enter the email address for the administrator account. 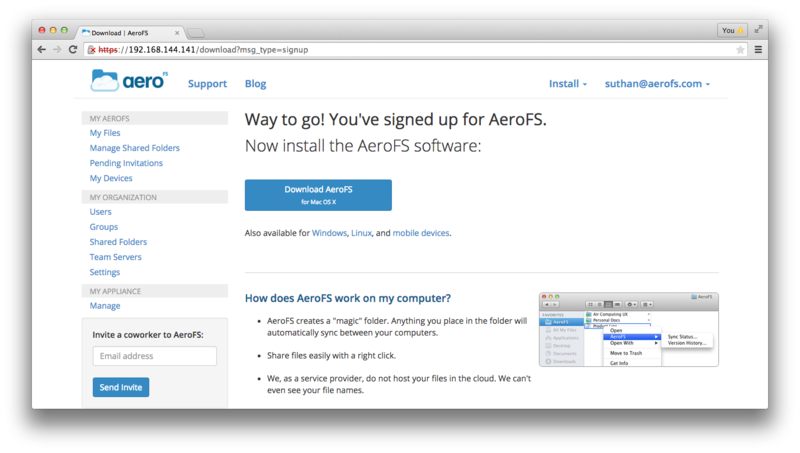 Go to your email inbox and open the "Complete your AeroFS sign up" email and click on the sign up link in the email. Then enter your name and password and click Sign Up. You should now be logged into your AeroFS Web Admin Panel. From here you can invite users to your organization.